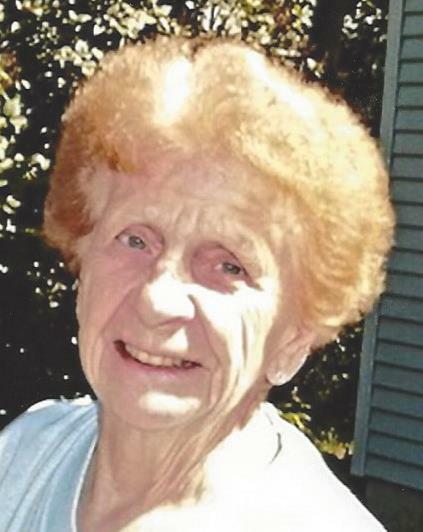 Betty Jean Reynolds, 87, of Frewsburg, went to walk in the Lord’s garden with her husband on Aug. 12, 2018. Betty attended Frewsburg Central School and spent many years working in the dry-cleaning industry, including employment at Shea’s and Anderson’s. She also worked as a housekeeper at Lutheran Social Services. Betty enjoyed spending time in her beautiful flower gardens. She was predeceased in death by her loving husband, Norman Edward Reynolds Sr.; her parents, Vernon Blood Sr. and Florence Stone Blood; her son-in-law, Steve McKinsey; three brothers; and six sisters. Betty is survived by her son, Norman Reynolds Jr. and wife, Melanie; daughters: Deborah McKinsey and Julie Reynolds; grandchildren: Sean Reynolds and wife, Courtney, Susan Thackeray and husband, David, Melissa Dempsey and husband, Ray, Steve McKinsey and wife, Tammy and Michelle Genson and husband, Jason; 14 great-grandchildren; her sister, Florence Blood Minton; a host of other relatives and friends; and her beloved dog, Goldie. The funeral will be held at 11 a.m. Friday in the Peterson Funeral Home, Frewsburg. Burial will be in Allen Cemetery. The family will receive friends from 4 to 7 p.m. Thursday and one hour prior to the service in the funeral home. Memorials may be made to Chautauqua Hospice and Palliative Care, 20 West Fairmount Ave., Lakewood, NY 14750. Condolences may be sent to Betty’s family at petersonfh.net.